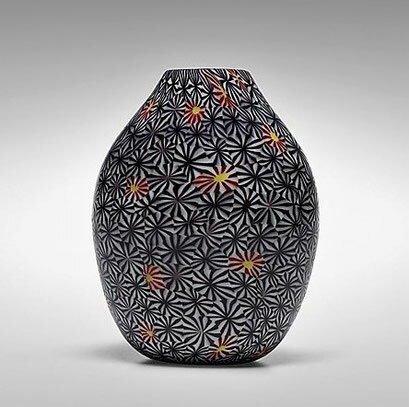 Ermanno Toso was born in 1903, in the ancient glassmakers family. In fatc the Toso’s story began in 1854 with six brothers; Ferdinando, Carlo Francesco Nico-lò, Liberato, Angelo, Giovanni and Gregorio Toso, Pietro’ s sons from the branch Toso “Cangio-ro”. All the protagonists of Fratelli Toso’ s story descend from them. At the beginnings the factory produced common glasses, but then it specializes rapidly in the artistic blown glass production: objects, lamps, mirrors, Fratelli Toso’ s production was extended, always with high artistic and handcrafted value. 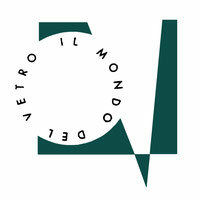 After 1880, they were one of the first ones to reuse the ancient technique of murrina and just the murrina, during the years, became Fratelli Toso’ s symbol, its trademark. From 1924 Ermanno has been Fratelli Toso artistic manager and designer: many of his designs have been displayed at Venice Biennale from the 1930 until 1964. He designed beautiful lines of murrina vases such as "Kiku", "Redentore", "Foglie", "Nerox" and "Petoni". In the first part of his career he created lines of vases fully made by traditional murrina, new designs but with the same style: later he designed innovative and colorful murrina used to realize modern lines of vases. Traditional colours and shapes are revolutionized. After his cousin Michele' s death in 1946, he had to replace him as commercial director: indeed he hired Pollio Perelda as designer to help him in the artistic direction. Betwen 1936 and 1964 Ermanno participated to all the Biennals of Venice and Triennals of Milan. Thank Ermanno and Pollio, in those years the most fascinating murrine were realized by the ability of glass masters, such as Zuf, Finottello, Ferro; sets of murrina have been presented in the most important exhibitions at national and inter-national level. But not only murrine; in the most successful period, between the 40’s and the late 60’s, there were also many sets of artistic soffiati realized always thank the design of Ermanno Toso and Pollio Perelda, and to the very capable hands of Fratelli Toso’s masters.